These stunning winter berries are a lovely shade of Christmas holiday red and look fantastic against the white in this image. 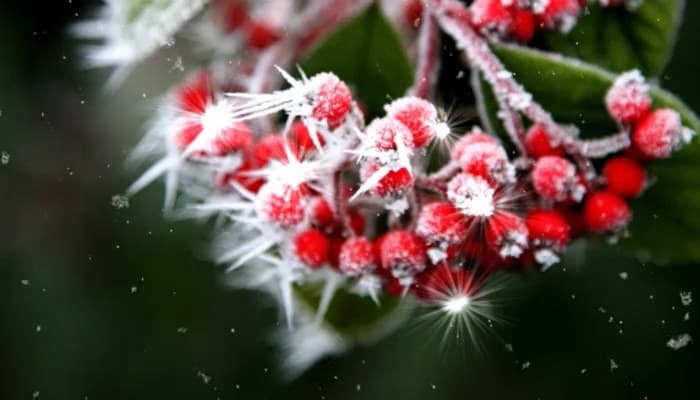 The berries glisten with the morning frost on a cold winters morning and you can practically feel the bite of Winter in the air with these beautiful business holiday ecards. The animation is truly stunning in this image when the card plays as the berries glisten and sparkle. There are spiky icicles surrounding the berries, to give that extra artistic edge. This card would look fantastic with red text really setting off the colours in the picture, so why not log onto our website now and take a look. Simply register an account with us completely free of charge. You are then able to design as many cards as you like and you can see how personal you can make these Christmas ecards for business. You can design as many cards as you like with us here at the ecard shack. When you have a registered account, you save your designs and edit them as and when you need to. So please feel free to register today! We are always here to help if you need us and you are under no obligation whatsoever. Call us today, we are always happy to help, whatever the query.